The Emir of Kano’s Palace in Kofar Kudu area of the ancient city hosted many of the activities starting from the Kunshi ceremony. The adorable bride was quartered in the home of her mum, the Emir’s first wife, HajiaSadiyya, who was obviously filled with joy. The ceremony itself was held at her fore court at the Giwa Wing. Traditionally, the Kunshi is like the bridal shower, where the bride is specially prepared indoors for matrimony. It also an occasion where she dances and generally has fun with friends and members of the family. We were told that though other wives of the Emir could attend, the mother of the bride could not savour this occasion. Thus, Siddika was heralded with royal trumpets and drummers as she arrived the venue, every step she took was met with cheers. When she settled into her specially-crafted seat, the short ceremony began. There were a few speeches before the ceremony dovetailed into a session of eating and dancing. The following day, it was another important ceremony known as the Kamun Amariya, this literarily means catching the bride. It was at this ceremony that many of the guests caught a first glimpse of the handsome groom, his friends and family members. According to Hajiya Zainab Sanusi, the bride’s aunt, Kamu Amariya is one of the important events of the wedding ceremony. “Kamu Amariya” literarily means “catch the bride”. The groom’s family comes and negotiates with the bride’s friends for her release to them. It is usually a fun-filled night. This was no different. At night, Hajiya Sadiyya Sanusi treated guests to a royal feast at the Mother’s Night inside the upscale Meena Hall, which was attended by mostly women of both families. The couple made an appearance, and because they were not officially married, one could see that they tried hard not to be too intimate in the open. The Walima or Wedding Fatiha was the official nuptials of Siddika and Abubakar. This was the ceremony where in the presence of Islamic clerics, the two families will agree on a bride price, exchange pleasantries and become one. Elders of both families were there and the ceremony took less that ten minutes before the Clerics declared the marriage sealed and cheers emanated from all corners of the venue. This was a male-only ceremony. The pomp and pageantry of the royal household soon unfolded within the Palace immediately after the fatiha. This was when His Majesty stepped out from his inner chambers into public glare in a sumptuously decorated horse. It was such a spectacular sight to behold as indigenes and guests stood in awe while he gingerly galloped along. The Emir, soon dismounted and spent time receiving guests who had come from far and near to felicitate with his family. The show of obeisance and his open door policy of receiving. All poor was quite instructive. Emir Sanusi later hosted some of his select guests to a private lunch in an inner part of the palace. The guest list was so scrutinized that all those who partook of this royal gourmet feast, including this reporter, were less than 15! Those at the table with the Emir included Mr. Wale Edun, Chief SOB Babalola, NBA President, A.B. Mahmoud, SAN and businesswoman, Hajia Bola Shagaya. Later that evening, the couple and their families treated guests to a first-rate Wedding Dinner at the popular Afficent Centre. This was when the Siddika and Abubakar were at their sparkling best. The bride was resplendent in her lovely gown, and her make-up was flawless, it had to be because it was handled by no one but BMpro boss, Banke Meshida-Lawal. They therefore arrived the venue in smiles heralded by their friends who had danced into the arena earlier. The décor was top notch. Everywhere glittered as exotic chandeliers and candles glowed. Fresh flowers and lovely centre pieces combined to ensure that the venue was welcoming and cosy. The Special Guest at the occasion was First Lady, Mrs. Aisha Buhari who was represented by First Lady of Sokoto State, Hajiya Miriam Aminu Tambuwal. In her welcome address, Hajia Bilikisu Bello, an aunt of the bride described the event as the wedding of the year. She noted that it was great that the families were ending the year with such a joyous occasion. She thanked God for bringing the families together and prayed that the couple will enjoy marital bliss. 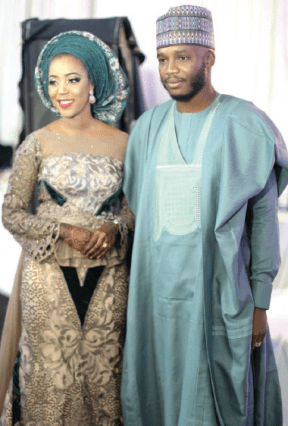 Friends of the couple also took their turn to speak: The Maid of Honour, Aisha Madugu was full of praise for the beautiful bride “You are everything I ever asked for in a best friend. There are really not enough words to describe the kind of best friend you have been to me, and there are really not enough words to describe how happy I am for you tonight. We have laughed, we have also cried together. All I can wish you is to be a wonderful wife and in the future a great mother. I know that you have found a good man. I love you so much and May Allah bless your marriage abundantly. Thereafter, the hilarious Master of ceremonies invited the couple for their very first dance. Later, they cut their cake and guests were entertainment by a rising musician. The groom later thanked all guests on behalf of the two familes. He was so full of thanks for the Sanusi Family for allowing him all the way from Katsina take their daughter’s hand in marriage. “I will love and cherish her forever”, he rounded off -everyone cheered. He thanked his parents and members of their family for the immense support and then rounded off that he will love and cherish Saddika forever-and everyone cheered! From then on, the event took a life of its own, guests had a full course meal, assorted drinks and then danced till well into the night.